About: Bar & pizzeria restaurant as well as a deli serving delicious mediterranean food in a laid-back atmosphere. While Camden is not renowned for its gastronomy, a little further north in Chalk Farm there is a slightly more varied array of cafes and restaurants, even if they are pretty safe options such as Café Belgo and La Porchetta. A little more unique is this Italian bar/pizzeria, offering so much more than just pizza. Its combination of laidback drinking and eating would be right at home in any Mediterranean country, instead it sits on Chalk Farm Road, comfortably squeezed between vintage clothes shops and opposite Camden Lock Market. 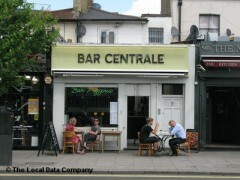 Once inside, Bar Centrale reveals a bright, airy dining room with 60s memorabilia scattered around, including a Vespa and a jukebox, however the white walls and neat wooden furniture manage to look chic enough for Chalk Farm regulars. Old soul records play discreetly in the background interrupted by the occasional Italian chatter of the staff and the coming and going of customers, but the mouthwatering deli counter is the main focal point, displaying Italian breads, cakes, cheeses, antipasti and cold meats. The aroma of Italian sausages being cooked wafts over to where we are sitting and we gorge ourselves on a flavoursome cheese and sundried tomato pizza, washed down with fragrant Italian coffee. Customers come and go, popping in for a ciabatta to go, sitting down for lunch with a glass of prosecco or nestling in a corner with their laptop, taking advantage of the free wi-fi. Bar Centrale have managed to created a charming, cosy neighbourhood eatery with a European twist. Thiese are the best pizzas I've had since moving back to London from Milan & going back for more !!!! Bar Centrale well what can i say.......truly unique. As u walk in u notice the art decor and warm atmosphere. The staff are exteremely freindly and the food is incredibly authentic with most ingrediants shipped from abroad. We went there with a group of 20 of us for a hen night and found that we ended staying there...part of it was down to my friends taking a liking to the brothers that run the place.